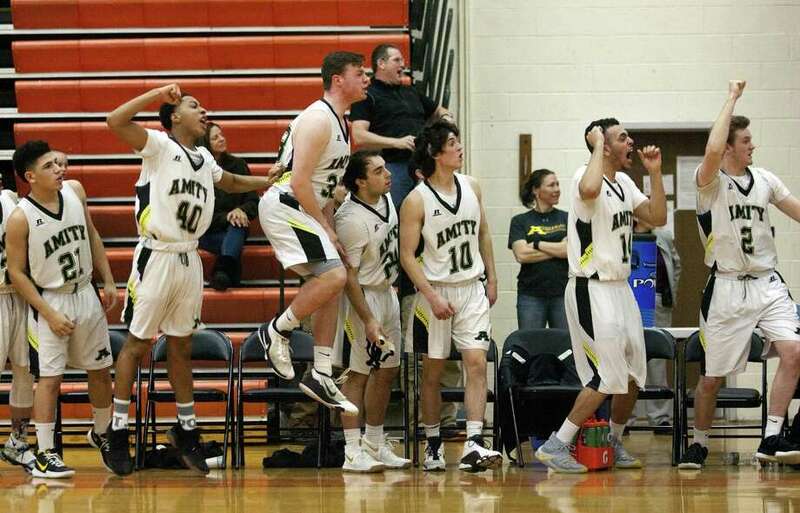 Amity players jump off the bench after the team defeats Newtown during Division II semi-final basketball tournament action in Shelton, Conn., on Wednesday Mar. 14, 2018. SHELTON — Cole Wissink was going to do whatever he can to get to the corner to block the final shot of the game. The Amity High freshman got there just in time to block Ryan Escoda’s shot into the Newtown student section. Wissink said he heard the buzzer sound. So did the Amity students as they piled onto the floor at Shelton High Wednesday night to celebrate. “I’ve see him going for the shot. My instinct is to go and block it. I might as well,” Wissink said. But the three referees huddled to determine if any time should be put back on the clock. They didn’t and the Spartans’ celebration continued. No. 9 seed Amity held on to beat No. 25 Newtown 48-45 in the Division II state semifinals. It’s the first appearance in the finals for the Spartans (20-6), who were also appearing in their first semifinal. Amity will face No. 2 Immaculate Saturday at the Mohegan Sun Arena at 8:30 p.m.
Amity was the only team from the SCC to advance to the state semifinals in boys basketball. “We will enjoy the victory, enjoy going to Mohegan Sun over the weekend and play in the state championship, but we have to rely on our fundamentals and stay within ourselves and not get caught up in the emotion,” Nielsen said. Amity had as much as an 11-point lead in the fourth quarter and led by 10 after a Tyler Thomas free throw with 39.3 seconds left. Then Todd Petersen made a basket for Newtown, then Robert DiSibio (14 points) did the same. Tallcouch called for timeout with 16 seconds left and Amity now up 48-42. “My guys don’t give up. They played like that all year,” Tallcouch said. The Spartans proceeded to throw the inbounds pass away. Petersen banged in a 3-pointer to cut the deficit in half. Amity’s Tanner Thomas was fouled with 6.3 seconds left and the Spartans were still in a one-and-one situation. After an Amity timeout, Thomas missed the first free throw. Newtown quickly got the rebound and moved it to Escoda in the corner. Wissnik got there in time. Tyler Thomas (game-high 18 points, along with eight rebounds and two steals) picked up his second foul just 2:20 into the game and sat most of the first quarter. He re-entered the game with just over 2 minutes left and Newtown leading 10-4. The Spartans scored the next 10 points. Thomas also sat for a few minutes in the second quarter as Amity maintained the lead. Thomas, the SCC Player of the Year, had eight points in the third quarter when Amity extended its lead to double digits. Then Newtown, which pulled three seeded upsets to get to to Wednesday’s game, almost had a chance to make it four straight. NEWTOWN (14-11) Evan Eggleston 0 0-0 0, Nick Weiland 7 0-1 14, Robert DiSibio 5 1-2 14, Todd Peterson 5 0-3 11, Riley Ward 1 0-0 2, Shea Talbot 0 1-3 1, Ryan Escoda 1 0-0 3. Totals: 19 2-9 45. AMITY (20-6) Tyler Thomas 7 2-5 18; John Nolan 1 0-0 2; Joe Benedetti 1 0-0 3; Chris Bierezowiec 4 2-3 10; Cole Wissink 2 0-0 4; Tanner Thomas 4 3-6 11; Sebastian Formica 0 0-0 0. Totals: 19 7-14 48. Image 2, kid with black vest and maroon hat……look at that vertical, he should be on the basketball team! FCIAC,get lost they beat FCIAC Stamford by 30 points who beat the number one seed Simsbury.They also beat FCIAC Warde convincing during the year.They are a very solid team and deserve to be going in a very wide open D2 tournament. goes to show you how important your draw is. Amity is not even a top 5 team in the SCC yet there going to the finals. Let’s get serious here…not a fan of either team but attended the game . Poorly played basketball on both sides with equally horrible coaching . Amity could have iced this pathetic performance by pulling the ball out and running clock up big with a few minutes to go but for some strange reason decided to shoot as quick as possible with every possession , miss and basically hand deliver a comeback to Newtown on a silver platter down the stretch .Newtown’s Head Coach was just as bad as I have never seen an offense sit around the 3 point line without movement, picks , scheme, plays, etc . Miss shots and basically not rebound .Their 6-5 center should have attacked the basket all night but instead , sits outside relying on jump shots instead of layups and going to the foul line. Hey SCCFan, why do we need to “put this in perspective?” And whose perspective should we use…yours? THEY’RE KIDS!! IT’S ABOUT THEM! YOU HAD YOUR CHANCE. Move on. What some of you commenters fail to realize is that this is still a bunch of kids throwing a ball at a hoop. For most of whom, this will be the last games they ever play where all the uniforms match. But you know what’s beautiful? 20 years from now Amity or Immaculate will be a state champion and all you keyboard heroes won’t be able to do a dam thing about it! And before you decide to play the “everyone gets a trophy, wussification” arguements, I will simply request you list the Catholic (recruiting), or School of Choice(recruiting) school your kid attends so we can have true transparency. You did get one thing right…the coaching was horrible. But then the Amity coach has been horrible since he started…and he just might be a “state champion head coach”. Guess he might get the last laugh.